A couple of months ago, I went to a class assembly for my third-grade son, Cooper. After it was over, his friend's mom came up to me and asked to speak to me privately. She then informed me, that according to her son, Cooper was being "bullied" by another child. I was, of course, thankful yet alarmed and I immediately questioned my son. The boy was in his class last year as well, and I knew he was a behavior problem. When I asked Cooper what was going on, he responded, "It's okay, Mom. I am handling it". He was trying his best to use whatever methods he knew to take control on his own. I was so proud, but of course a little skeptical. I wrote an email to his teacher to tell her that I knew that this student was giving Cooper a bit of a hard time and I wanted to keep in touch about it, but that Cooper was doing his best to figure it out. I think I got a response in about 90 seconds. And of course it referenced the word "bullying". I was quick to tell her that I didn't think the bullying term need be applied in this instance but I appreciated her reaction. I think there is a real problem in the United States that needs to be addressed...IT IS NOT ALL BULLYING. If someone makes fun of your child a few times, it is NOT bullying. If someone makes fun of your child relentlessly, it IS bullying. You cannot, no matter how much you want to, erase the fact that some kids will do these things. But the stupid kid stuff that you are trying to call bullying is diluting the term. When I was about 16, someone prank called me to say I had a "pig nose". Maybe they weren't far off (and I am pretty sure I know who it was) because yes, my nose turns up a bit, but wow I felt terrible. Was that bullying - NO. But I bet many parents these days would disagree. You cannot protect them from everything, and if you try, you will be doing them a disservice. Kids need to try and fail. Their confidence and wit need to be challenged a bit. It isn't easy to live in the "real world" and they should be able to realize this as they grow up. What are we teaching them if every time someone treats them with disrespect that we can throw the bullying card? I know that bullying exists. And I know it is a horrible thing. Please stop making it harder for us to take it seriously. And please stop taking away from letting our teachers and administrators do their jobs. They have enough to worry about with all the testing prep. We all have our holiday traditions. Some families have way more than others, and mine probably falls somewhere on the low end of the spectrum. One in particular is on my mind though. My mom and dad are on their way to Singapore, in the air somewhere above Eastern Europe, and I am very much looking forward to something in their suitcase - VELVEETA CHEESE. You see, this is the main ingredient in the biggest Lehman Christmas Eve tradition of all. 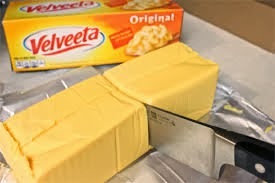 Half of you are totally cringing, the other half know the truth...Velveeta is sooooo good. It makes the best grilled cheese, and it is instrumental in the greatest au gratin potatoes of all time. (French words add class, right?) We always have the potatoes on Christmas Eve, and since I can't find regular Velveeta here in Singapore (just the kind with the Jalapenos...deal breaker!) it is making the journey all the way from the US of A. Have no refrigeration? No worries my friends, Velveeta does not need it. I bet the Doomsday Preppers people horde it along with their gas masks and guns. My dad's mom, "Grandma Lehman", is responsible for my processed cheese infused potato obsession, and god bless her for it. She oddly insisted that peeling the potatoes AFTER you boil them is the secret in her recipe, but that is obviously a joke. In fact, I think she's looking down on us from heaven, burning the hell out of our fingers trying to peel hot potatoes (who has time to let them completely cool - I want to eat the potatoes THAT DAY), and laughing. She always did have a funny sense of humor. She's like "I can't believe they thought I was serious." Well joke's on you Grandma - I stopped that practice years ago. And it tastes the same. And I just realized that I only need HALF of the big block of orangy fake cheese for my dish, so now I can fantasize about how I will use the other half. The possibilities are endless. NOTE TO KRAFT - you totally need to contact Top Chef and have a Velveeta-sponsored quickfire challenge! They've totally sold out on other quickfires so I'm sure if you pay them enough they will go for it. Now THAT would be some good TV! I need to go to bed since I have to get up super early to pick up the parents at the airport. Sweet dreams my friends. Or in my case, cheesy dreams! I'm so over the "Mom Guilt"
So apparently "mom guilt" is the new catch phrase. And it drives me crazy. 1. Two Facebook friends linked to a blog post about a stay-at-home mom plagued with "mom guilt". 2. My friend, Rachel, jokingly said she had "mom guilt" because her cookies for the school party weren't coming out right. When I told her to knock it off, she suggested I write a blog post. (Done, Rachel). 3. Five minutes later, I was on People.com and saw another blog post by actress Marla Sokoloff (loved "The Practice"!) about working "mom guilt". ENOUGH ABOUT THE "MOM GUILT" PEOPLE! So after some googling, I've gathered that moms feel guilty about every damn choice they make. They feel guilty about working, not working, giving their kids processed food once a year, not spending enough time with them on a day-to-day basis, leaving them for vacation or even a date night, not putting them in the highest rated schools, denying them material things that their friends have, being too strict, being not strict enough, pressuring them about grades, not being involved enough in their school work, being crazy helicopter parents, letting them have too much freedom.....STOP THE MADNESS. These articles make it seem like us moms are pathetic, spineless, wishy washy victims who need to band together to lament about these complex parenting choices we have to make. It is like none of us could possibly just ever be confident and GUILTLESS in the choices we make. Well knock it off, ladies. 1. I left my firstborn, Sophia, overnight with my parents when she was 10 weeks old. It was for my best friend's wedding and I chose to stay away overnight even though it was a few minutes away. I wanted to party and my mom was drooling at the thought of having her for a whole night (The only bad part was the unfortunate showing I made in that strapless maid of honor dress that I picked out months before because I was SURE I was going to lose the baby weight quickly). I have left my children with friends and family way more times than I could ever count (even for ten days!) and my kids will not be in future therapy for it (maybe for other things, but I know it won't be for that). Here's another take on it - if you don't leave your kids overnight with people, you are damaging their independence and self-confidence, as well as their opportunity to bond with their grandparents/friends/other family members in a way that is only possible with extended visits. You may disagree with me, but the times I spent with my grandparents by myself, sometimes for two weeks each summer, are my favorite childhood memories. My kids have no separation anxiety (I admit my younger, Cooper, had some in preschool, but never with me leaving other times) and they are two of the most independent kids I know. Additionally, you and your significant other NEED alone time. How can you possibly be good parents when you're never taking a real break, never having quality adult time to remember why you got married in the first place? You say you'd rather stay home with the kids - I call bull. I'd like to know what your husband really thinks of that. You say it's more trouble than it's worth to leave the kids, that their bedtime routine is too complicated (I've heard that one over and over)? That's because you've LET it get that way and you never go anywhere! You have bred those little monsters and you need to turn that ship around! I understand if money is tight - but go stay at a friends house for the night. We do it all the time! 3. I don't work. A long time ago I did. Then I had Sophia, quit and started a business. A few years later, I moved to Asia, and gave the business to my mom. I'm not sure I will officially work again...I have no idea. But I don't have guilt either way. Kudos to you working moms, it must be really hard. Of all the "mom guilt" posts, I get the working mom ones the most. If you need to work to put food on the table, or because you are a better mom if you have a career, then good for you! Stop the guilt! If you feel that bad and can afford to quit, then do it. Just be happy in your decision either way. The guilt isn't helping anyone - certainly not your kids. 4. So many moms and dads are terrified to move with kids. Do NOT think it is a bad thing to move your kids to a new state, or even a new continent. Change is GOOD for kids. I understand as they get older it gets harder, but having kids adapt to new things builds traits in them that will carry them far in adult life. For more on that one...read this post! 5. As far as discipline, here is where I actually do care what you do - because your decisions affect my children. Don't feel guilty if your parenting style is different from mine, AS LONG AS you raise polite, kind and respectful children. If your kids are mean, violent or rude, something has to change. It is not always your fault, and I get that, but still - something has to change. I rarely even go to the pool in my complex on the weekends anymore, because so many parents think that they should just let their kids "cry it out". Your kids are not MY kids, and it is unfair to subject other people to that. Please be aware that it's not all about you. I am a super strict mom, and if that doesn't work for you, and you are raising some stellar kids, then more power to you! The bottom line is please own your decisions and stop wasting so much time worrying whether you are doing the right thing. Usually you just have to look at your kids to know the answer to that. If you are not sure, then you can bring them to my house for a few hours and I will give you my full report. That was a joke! Well....maybe. I'm not sure what prompted it, but a few days ago I sat Sophia down and had a serious discussion with her. It was short but hopefully effective. I told her that I hope that during her teenage years, she doesn't treat me like I treated my mom. She was quite surprised at this revelation and was interested to hear more. So here it is - my very public apology to my mother for being moody, mouthy and sometimes very mean to her while growing up. I am sincerely sorry. I wasn't a "bad" kid. In high school, I got great grades, generally did what I was supposed to, and NEVER did drugs. NEVER. Like almost everyone else, I experimented a little with alcohol and yes, got busted by my parents, but came out unscathed thankfully. High school was rough though - I had some really great times, but generally felt like I didn't fit in anywhere. I didn't have a boyfriend, not one, because I was totally insecure. Thankfully, all that started to change in college and now I might be considered too self-assured by some - I realize I come off as judgmental sometimes. But none of this helped my poor mom back then! With a sister who was critically ill for years, and some job changes for my dad, our house was already bursting at the seams with stress and worry. I wish I had the maturity at that age to realize that it was in my power to help the situation, not cause more problems. 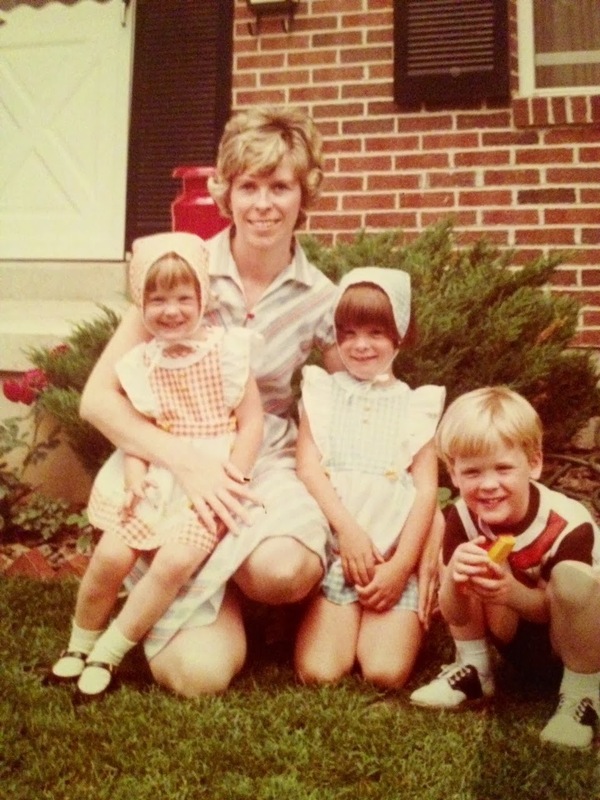 Looking back, I realize my parents did the best they could with what they had to work with. As a parent now, I know that it's really all you can do. You make decisions, they might not always be right, but at the time they seem right. 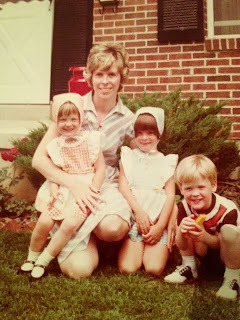 Compared to most kids, I had a very blessed upbringing and never doubted for a second how much my parents love me. So mom and dad - thank you so much. I have a fabulous life now because you were good role models. You weren't perfect, but I was certainly far from perfect - and none of it matters now. I very much enjoy the adult relationship we have. I can't wait for you to visit us in Singapore next week, and I cannot wait until you retire and the kids can run across the street to your house.